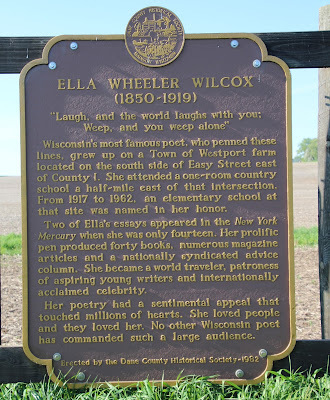 Wisconsin's most famous poet, who penned these lines, grew up on a Town of Westport farm located on the south side of Easy Street east of County I. She attended a one-room country school a half-mile east of that intersection. From 1917 to 1962, an elementary school at that site was named in her honor. Two of Ella's essays appeared in the New York Mercury when she was only fourteen. Her prolific pen produced forty books, numerous magazine articles and a nationally syndicated advice column. She became a world traveler, patroness of aspiring young writers and internationally acclaimed celebrity. Her poetry had a sentimental appeal that touched millions of hearts. She loved people and they loved her. No other Wisconsin poet has commanded such a large audience. The marker is located adjacent to an open field on eastbound Easy Street, about a half-mile east of its intersection with County Road I, at or near 5202 Easy Street, Waunakee, Wisconsin 53597. With love the word for each note. In the song of my life to-day. Has made it a downy nest. This marker is No. 20 in the Dane County Historical Society Markers Series. Portrait of Ella Wheeler Wilcox. Frontispiece from her book of poems "Three Women", published 1897. This image comes from the Project Gutenberg archives and is in the public domain. Photograph of American writer Ella Wheeler Wilcox (1850-1919), with copy of signature. From her book New Thought, Common Sense, and What Life Means to Me. Chicago: W. B. Conkey Company, 1908. My perpetually patient pup, Dexter . . . The marker is located in Waunakee, Wisconsin.